I ran into one of my customers over the summer and noticed she was wearing a solitaire pendant with a Circle of Life pendant her fiancé had purchased from us months earlier. When I asked her about it, she explained that she loved her Circle of Life, but the extra diamond was a family heirloom she held dear to her heart. After discussing this a little further I suggested we could incorporate one into the other and she immediately loved the idea and decided to have three graduated stones bridging the diameter of the circle. A few weeks later, I received her pendants in our shop and started to figure out the configuration. Her stone weighed 3/4 of a carat and unfortunately measured less than a third of the distance we had to bridge. If we were going to go with the original concept, that meant her stone would be in the middle position, which became a substantially more expensive option, or we would have to use 4 stones to go the distance. She was not overly happy with this idea so we kept looking for a better solution. After a couple of days we came up with an idea that had some potential. 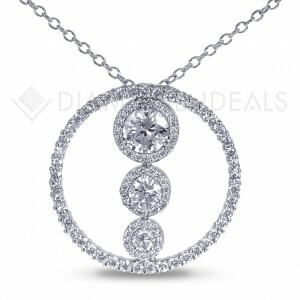 Why not put a halo of diamonds around each of the interior stones, mimicking the Circle of Life? We worked out the exact configuration on a CAD. The price was well within the original budget so she gave the project the go-ahead. Her family stone was set in a three-prong setting. We kept this detail alive in the new piece, setting all the new centers with three prongs in stead of the traditional four.